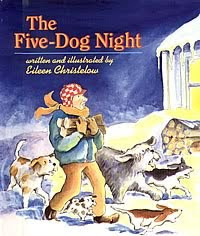 That phrase — “New England stick-to-it-iveness” — reminded me of another fine Vermont illustrator who wrote another fine book about cold New England winters: The Five-Dog Night, by Eileen Christelow. The story follows a pair of elderly neighbors, curmudgeonly Ezra and busybody Betty, through one year on a windy New England hilltop, but the season the book lingers on, for good reason, is winter. That’s where “three-dog nights” and “five-dog nights” come in. As the chill wind begins to blow and the temperature on the hilltop drops below zero, Betty worries about her stubborn neighbor, who refuses to keep his stove running at night. When she sticks her nose in and tells him so, Ezra mutters what she considers crazy things like, “It was only a three-dog night.” If you aren’t familiar with this rural barometer of the bitterness of a winter night — where you need one, two, three, or even five dogs on your bed to keep you warm — you won’t easily forget it after reading Christelow’s delightful book. Our children love the dogs and the story that shows adults arguing and being stubborn. I love the independence and pride of the book’s two elderly characters and the deft and completely realistic way that Christelow shows their growing friendship. Perseverance, inventiveness, and humor — all components of that famed Yankee stick-to-it-iveness that Susan mentioned. It’s a good trait to have any time of year. That said, I think it’s going to be a five-dog night tonight. . . The true story behind the story and more.